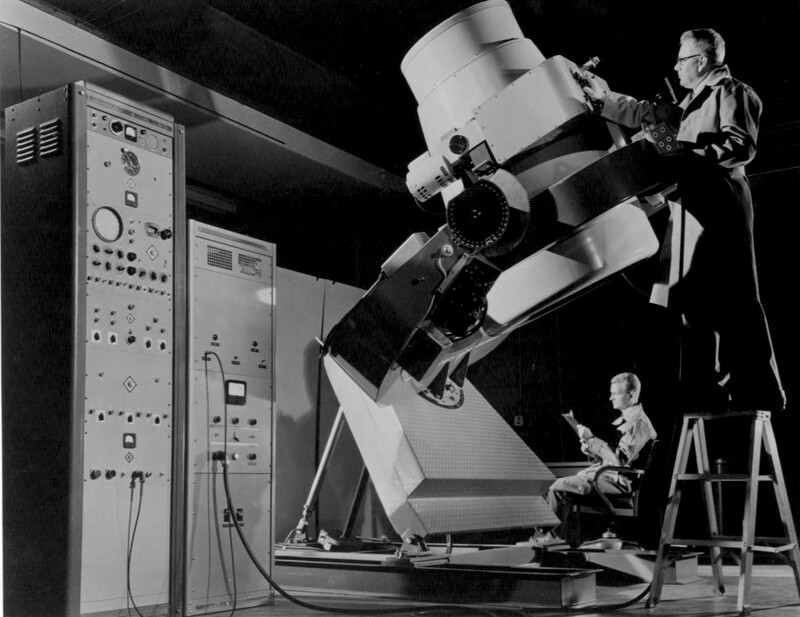 The Air Force Baker Nunn Satellite Tracking Cameras were similar to the Smithsonian Satellite Tracking Cameras. This is the first of three Air Force Baker-Nunn Cameras. The Baker Nunn Cameras are designed to have a triangular base. Mounted on the base is a Fork rotating 360 degrees. A Gimbal Ring is mounted to the Fork tines ends that will rotate plus or minus 80 degrees in elevation. Mounted on the center of the Gimbal Ring is the Optical Camera assembly. The Optical Camera assembly can be motor driven plus or minus 70 degrees in a 2nd elevation axis that is 90 degree to the 1st elevation axis. Both the Azimuth and Elevation rotations are electrically motor-driven. The satellite camera can be operated in a standard Alta/Azimuth mount. An alternate condition where the camera mount base rear support can be raised up with a ball screw jack. This allowed its azimuth axis to be tilted to a polar axis angle where its North/South location is to located on its final installation. An adjustable tubular column is installed to lock the mount in this angular position. This angular position allows the camera to place a celestial background photo of stars when a satellite photo was taken. The Baker Nunn Satellite Tracking Cameras consists of a three-element 20-inch entrance aperture corrector lens system. The corrected image is projected down to a 31-inch f/1 spherical primary mirror. The focusing converging image is then reflected back up to an optical shaped focusing surfaced back-up plate where the film exposure are made. For a satellite photo run with the Baker Nunn camera the following operations occur. The Satellite Tracking Cameras consists a continuous 35-mm length of film coming from a supply canister. The film is stopped for an exposure at the center of the film bridge and is then stretched over the optical shaped surface on a backup plate. The stretching of the film will place the emulsion surface of the film in focus over the total width and length of the films exposure. The film is then transported out to a take-up canister stopping with its trailing length ready for the next exposure. Continuously, another complete shutter is opening and closing, is blocking unwanted exposure during the film transport. Simultaneously an International time signal clock from the Norman Clock Co, Green Bay, Wisconsin is located at each Baker Nunn Satellite Tracking station. A time signal will be projected on the end of each exposure of the film. I am trying to find if any kind of satellite tracking camera was ever stationed on Madagascar. Thanks for any reply. I am trying to discover if any kind of camera telescope capable of photographing satellites was posted at the NASA Madagascar station. Thanks for any reply. I am trying to discover if any kind of camera telescope capable of photographing satellites was stationed at the NASA Madagascar site. Thanks for any reply.